This 5.56x45MM NATO ammunition is new manufactured with true NATO spec. boxer primed brass cases and true NATO spec. copper plated bullets, produced in Poland to NATO specs. This ammunition is some of the finest ammunition found anywhere and is supplied to many militaries and police forces that demand quality 5.56x45MM ammunition. 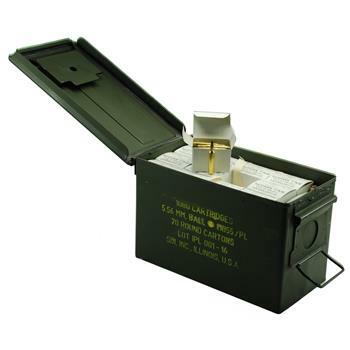 This 62 grain Full Metal Jacket projectile is loaded into a high quality reloadable 70/30 brass cases with a boxer primer. Stock up now on this high quality NATO 5.56x45mm ammunition!